Automatic portable boring machine saves time and money on the spot_新闻中心_Xinxiang Lantu Machinery Co., Ltd. The fully automatic portable boring machine is a professional engineering process, which mainly produces precision or holes on various parts of the machine according to requirements. Many outdated holes have to be repaired or mined, depending on the situation. In the manufacturing process of the fully automatic portable boring machine, when the mechanical space needs to be repaired, the disassembly machinery is not only time-consuming and monotonous, but also the time for the stoppage. It is easier to wear and rupture during the disassembly process, and the boring mechanical engineer in this field eliminates the need for disassembly and assembly machinery by means of on-site maintenance. 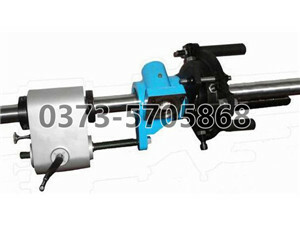 Some fixed machine parts, such as diesel engine mounts, cylinder blocks, ships, natural gas and hydroelectric enclosures, stator frames, etc., must be coupled to the hole alignment and boring machine, as well as other factory major equipment wear and damage, and require repair . Engineers in the production line can do this work with portable boring machines and face milling equipment and their skills. Time savings can obviously compensate for the cost of notifying the engineer to perform on-site instructional repairs. Field engineers can be called for planned maintenance or emergency maintenance, as the case may be. Compared to traditional moving parts that are damaged to a designated location, they are becoming more popular due to the many advantages of on-site maintenance. Better field service engineers have good quality portable equipment and other equipment that can be brought to the site for maintenance. In addition, first-line engineers should also be trained to successfully complete all kinds of difficult first-line maintenance work. The key to on-site maintenance of fully automatic portable boring machines is to find the right company, which can provide more professional services, and the right portable machinery is the key.